The internet is a great leveller, allowing people who are blind or housebound to gain access to a whole world of information. In the early days of the web, when all this information was in the form of text, all sites were accessible to visually impaired users, who could, for example, reset the text display size in their browser to magnify the text, or employ a screen reader to read out the screen text via the PC speakers. Yet now that many sites are designed using graphic and multimedia elements, many sites are inaccessible to visually impaired users - and despite the Disability Discrimination Act, we are continually seeing new or renovated sites appear which have been designed with no regard for accessibility. The emphasis on usability has always been central to Cornwell Internet's philosophy: we believe web sites should be content-driven, displaying your message in a way that grabs the attention without being gimmicky. It's not a place to show off our skills, it's a place to show off yours. It's a small step from this approach to ensuring that as many visitors as possible, regardless of disability, find your site easy to use. In 2005, this philosophy won Cornwell Internet a Visionary Design Award for the website we run for Anne Fine, the second Children's Laureate (www.annefine.co.uk). Helen Brazier, NLB's Chief Executive, said: "These awards are incredibly important. We estimate that less than a third of all websites are accessible to visually impaired people and our challenge to web designers and publishers is to create sites which are attractive and informative, but also comply with the Disability Discrimination Act by being accessible too." 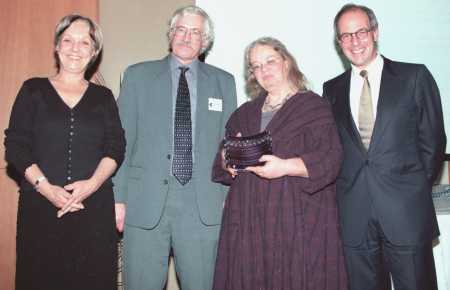 Anne Fine's website was the winner in the Children's Website category at the 2004 Visionary Design Awards. Anne said "I'm thrilled that Cornwell Internet have made www.annefine.co.uk so 'blind friendly' that it has won a national prize. We all want as many people as possible to have full and fast access to our websites. I'm grateful to Jean and Roger for taking this responsibility off my shoulders, and making it so easy for people who are blind or seriously visually-impaired. Many congratulations to them both." Another of our sites - designed for Newcastle Quaker Meeting (www.quakers-in-newcastle.org.uk) - was shortlisted in the Voluntary Organisations category. The Visionary Design Awards were a project of the National Library for the Blind (now part of the RNIB), which worked with website owners and designers to help them design accessible websites for blind and partially-sighted users. The 2004 Disability Discrimination Act makes it unlawful for a service provider to discriminate against a disabled person by refusing to provide any service which it provides to members of the public - and a website is a service! Below is a checklist of ten points for a more accessible website, drawn up by the National Library for the Blind. Many of these are simple common sense, or make the site easier to navigate for all users, not just those with disabilities. Use the ALT attribute to describe graphics and other non-text items. Ensure good contrast between text and background. Use style sheets to control screen appearance. Ensure text associated with links makes sense out of context. Provide a text site map. Ensure that the size of all text can be altered with browser controls. Give frames meaningful titles. Ideally do not use frames. Warn users about new windows or pop-ups. Make sure all multimedia elements are optional and provide a text alternative. The RNIB's Web Accessibility Centre has much more detailed information about accessible websites. from visitors to our sites, with any disability or none.